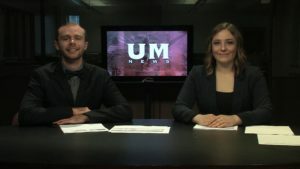 This week on UM News, students volunteer at local after school programs, the Outdoor Recreation Center is prepping for the winter sports season, and UM’s ice fishing club shows off their new gear. Anchors DJ Stewart and Meri DeMarois also show you Missoulians getting a first look at the US Capitol Christmas Tree before it arrived in Washington D.C. This show was directed by Natasha Woodworth and produced by Matt Skillman.